Note from John: If you’re looking to hire someone to do keyword research for you, check out our SEO consultants or ask Credo to help you find one. At the foundation of every SEO project is keyword research. Simply, keyword research is the process of identifying high volume, accessible, and profitable keywords to target with website pages or content. By conducting keyword research, you can put together a plan for the pages you need to create, content you need to write, and structure you need on your website to rank for terms and drive traffic and business back to your website. Keyword research is the process of identifying high volume, accessible, and profitable keywords to target with website pages or content. 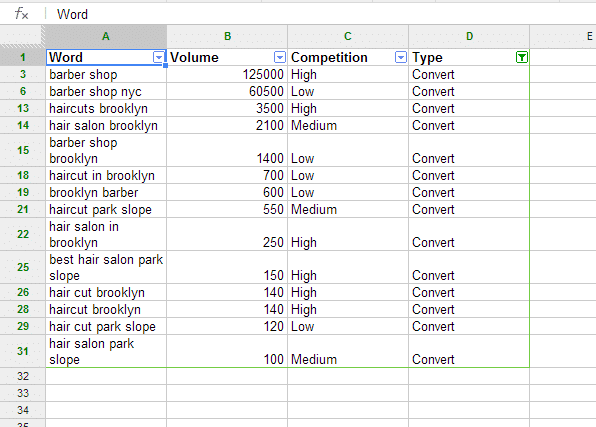 If you’ve never done keyword research before, don’t be scared. I’m going to show you how. The first step in any keyword research project is to brainstorm some possible words that can describe your (site, products, etc). Don’t be afraid to think outside the box, but also remember that the most commonly searched items are going to be common words. For example, if you sell red shoes, put down [red shoes] (just so you know, in the SEO world we use brackets [like this] to designate a keyword phrase) and also include [mauve shoes] and [bright red shoes], but realize that [red shoes] most likely has the higher search volume, though it is also sure to be the most competitive word. At this point, we need to clarify the types of keywords. Head terms – Normally in SEO when we talk about keywords people infer the keywords that will drive a lot of traffic, which we call “head terms”. A head term is a high traffic keyword (according to the Keyword Planner) that is typically shorter than other keywords (usually 2-3 words long to have a chance at being decently relevant, rankable, and driving decent traffic). Head terms are also the most popular terms to try to rank for, thus they are the most competitive. 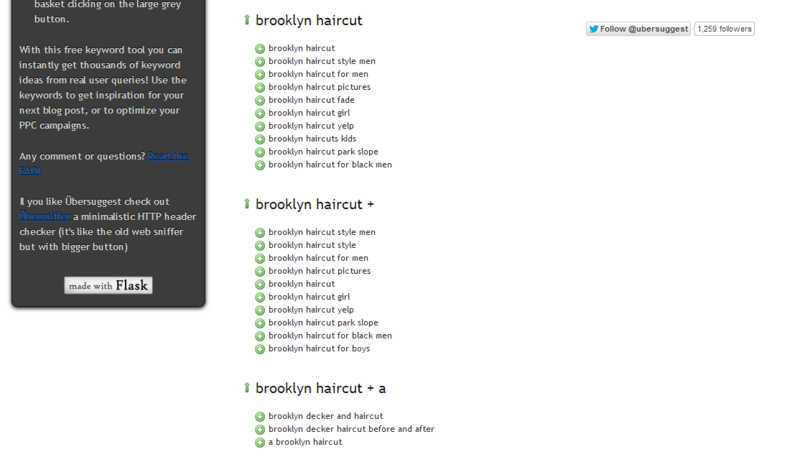 These keywords will be used on your site’s main pages. Mid-tail keywords – The next step down in keywords is what I call the mid-tail, though I have also heard it referred to as “the chunky middle”. These are not head terms, thus they are not as hard to rank for on the first page of Google (which is the goal, and even more specifically top 3 is the goal). If you are first starting your site, these are the first keywords to target while you build content on your site, attract links, and generally make your website stronger so that it can rank for more competitive terms. Long tail of keywords – the “long tail” is everything left that you’re not trying to rank for actively, but are permutations of terms that you are trying to rank for that drive traffic to your site. In many niches, this will include questions, mis-spellings, and the like. 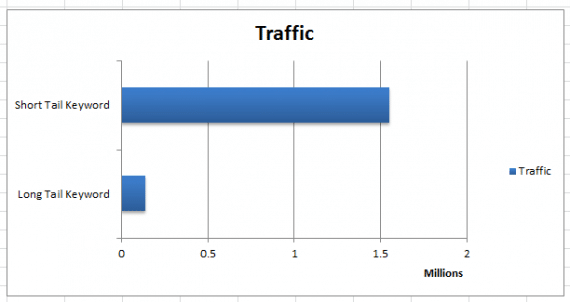 You should know that the longtail drives the majority of traffic to most websites. Technically, this tool is supposed to be used to buying ads from Google (which do convert well, but do cost money of course) but we can also use it for search purposes. First, you need to find some valid keywords. 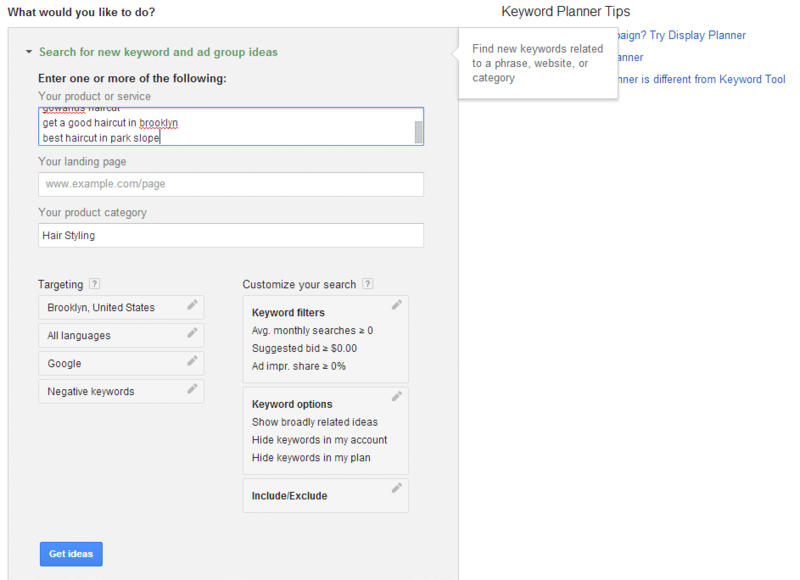 Do this on the tab that says “Search for new keyword and ad group ideas”. We’re starting fresh, so plug in as many ideas as you have. 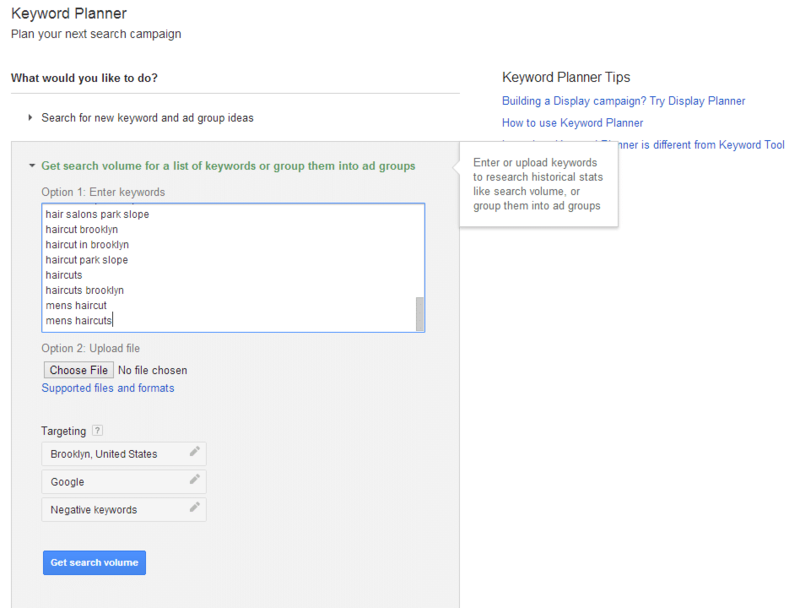 Now you are given a collection of Ad Group Ideas (if you were going to buy ads) and Keyword Ideas. 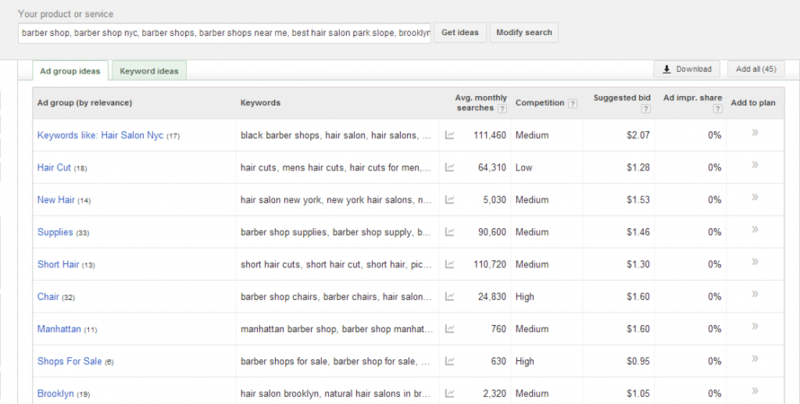 Keyword Ideas only shows you the keywords you put in, which is not hugely helpful at this stage. Instead, look through Ad Group ideas to see what ideas they may have brought up for you. 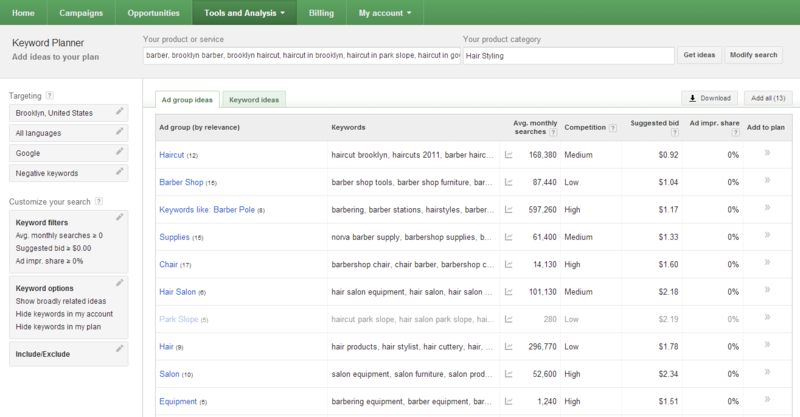 Using the Download button, download the keywords and their volumes. Now you can prioritize based off the volume. As you can see, I also put the type of word next to it. As a broad rule, plural = research and singular = conversion. This doesn’t mean to throw out the research words though – these can be awesome blog posts or other types of content to drive people to your website (remember the whole “inbound marketing” funnel). A few more tools to use are UberSuggest and Google Suggest to find ideas for keywords to investigate within the Keyword Planner. You should already know your business competitors, especially if you are a brick-and-mortar business in a specific location or set of locations. 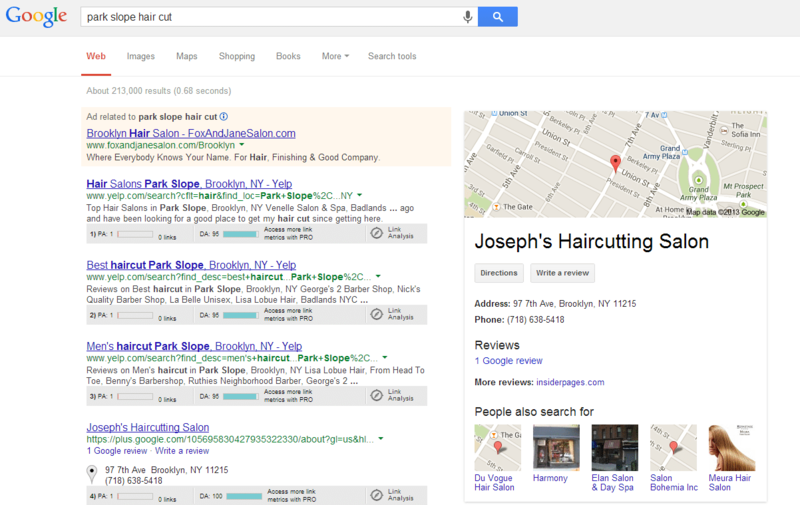 For example a barber based in Park Slope, Brooklyn should know who the competitors are – they’re the people right down the street from you. 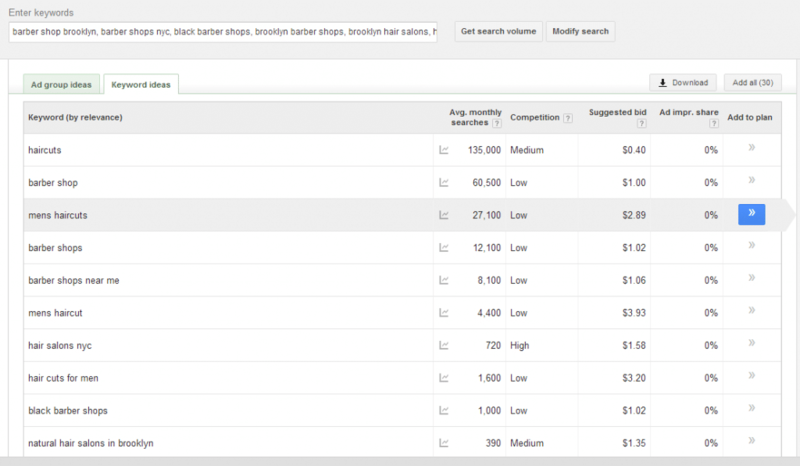 It’s outside the scope of this post to build a complete list of the sites ranking for your keywords, but after you’ve identified what you should be found/ranking for, it’s pretty easy to identify your SERP competitors. Now, you identify which keywords are most likely driving traffic for them. You can use a plethora of tools, like SEMrush, to find what they’re likely ranking for or what they are buying ads against. SEMrush is free to get limited access to data. Competitor analysis like this is most useful to figure out which terms that are targeting that you have not yet found but could target. For example, on HireGun I scraped the categories of some of my competitors to find the keywords they target so that I can build out pages as needed as well. 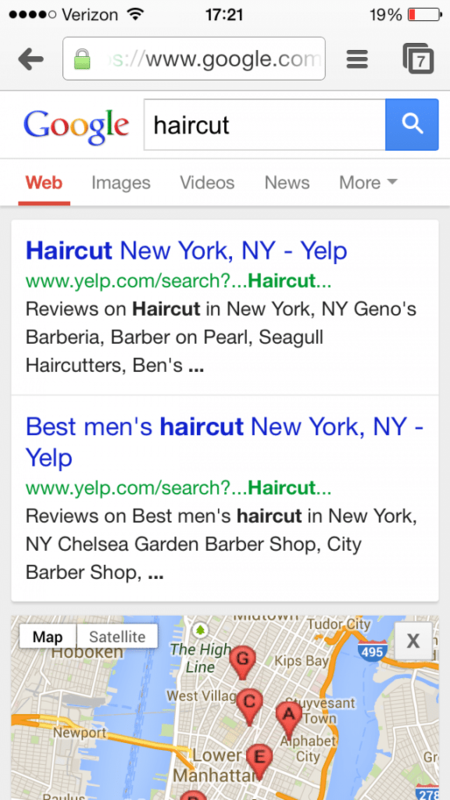 For more on simple scraping for SEO, check out this post from a few years ago. Once you’ve identified what your keywords are and what your competitors are ranking for, now you need to plan your website. 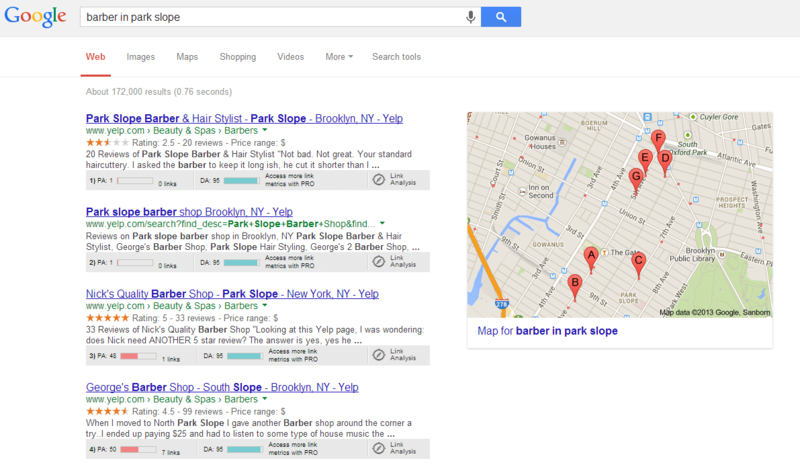 Often, the higher volume keywords will be targeted on your homepage or a category page. Keep in mind whether your business is local (like a barbershop, where you can rank in the local listings in Google), nationwide (where [shoes] will be very difficult to rank for, but [red men’s cole haan shoes] will be easier), or internationally where you have to think about alternate languages. If you want access to the Google doc about that I used, you can access it here (just make a copy to use it). 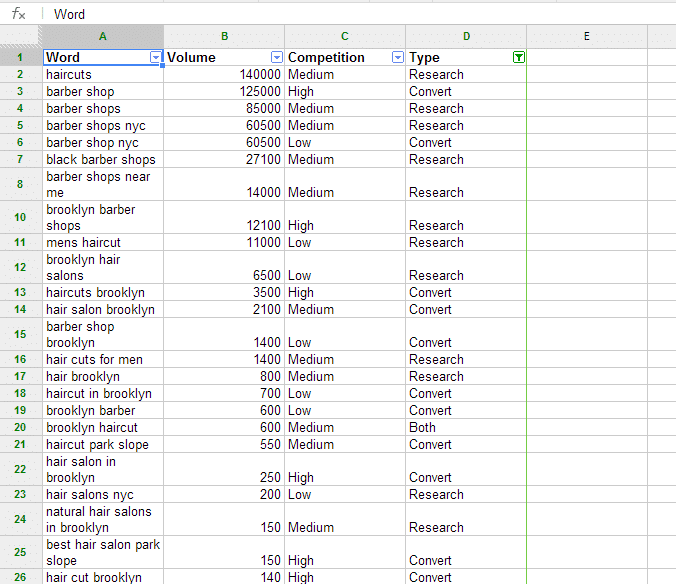 This has been an intro to keyword research. I hope it was valuable to you.